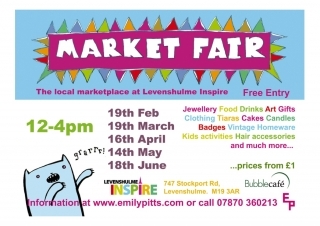 Levenshulme’s flagship community space, Inspire, is commencing a monthly Market Fair, hosting some of Manchester’s finest local crafters, artists and artisans on 19th February. Inspire, which opened in October 2010, is opening its doors to local people to experience the relaxed and friendly atmosphere of the space alongside local traders and the Bubble Cafe. The event, which has evolved as a collaboration between Inspire, the Bubbles Cafe and local Artist, Emily Pitts, will run every 3rd Saturday of the month. The idea evolved from a collaborative approach to bringing people into Inspire and creating a place that is owned by the community. Having run a craft fair in Whalley Range before Christmas, Emily felt there was scope for Inspire to become a venue for a monthly event. Staff at Inspire and the Bubble Cafe were already thinking along the same lines, so heads were brought together and the Market Fair is now a reality. 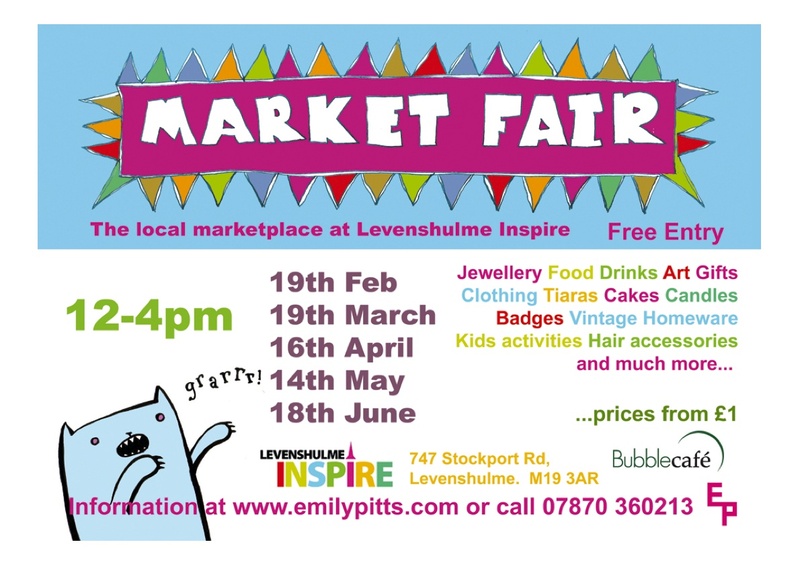 Emily said: ‘The fair will be a real celebration of what Levenshulme and Manchester has to offer. We’ve worked to bring together high quality produce and goods and it’s going to be a great success. The venue is amazing – a testament to partnership working.’ Louise Penfold, Manager of the Bubble Cafe, which is a Community Interest Company, is thrilled to be involved in the partnership: ‘We’re enjoying being a part of Inspire and bringing locally sourced home-cooked food to the people here. I can’t think of a better way to spend a Saturday afternoon than mooching around lovely craft stalls with a cup of tea and a home-made chocolate brownie’. Well-known local artist Laurie Pink is just one of the esteemed stall holders who will be at the Fair selling gifts, drawings and badges – starting at only £1. The event is free and everyone is welcome. There will be things for all the family including badge-making and drawing for children. So, if you’ve got nothing to do on 19th February and every 3rd Saturday, get down to Inspire and be inspired. Think its a really good idea! Thanks Cat. Hope you can come along and enjoy it! The Postcode is M19 3AR. Please can you let me know how I get a table/stall/space to sell my stuff? Hopefully on the 19th.